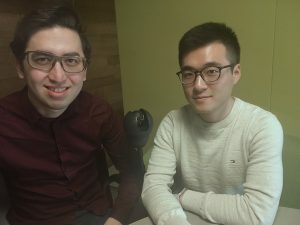 Dom Smith catches up with David Hojah and Frank Yiran Gao of Loro to discuss their goal of helping others through their innovative product that is aimed at giving wheelchair users around the globe more freedom and independence. F] My name is Frank, and I’m from China! I’m currently at Northeastern University in Engineering Management, and my goal with this business is to help people. D] I’m David. My background is in Aerospace Engineering, and I had some projects with NASA and some startups around Boston. Now though, I am passionately interested in Healthcare and Medical Innovation, and helping people to have a better life. Where did that inspiration come from? D] I’ve always been interested in helping people. I have always wanted to invent, and innovate something that helps humanity, since I was a child. I have always wanted to improve the life quality of people who are in pain, or have a challenge with physical, and mental ability. F] I have experience with coding, and can master different electronic components. However, that is still a challenge for me because I am responsible for putting everything together – the electronic parts and the hardware as well. That was a lot of hassle and learning. With the company, it was the vision, and the management. There’s a lot of multi-tasking! D] I have many things I want to do at one time. So for me, it was about managing myself and taking it step-by-step and learning to move gradually. I am super-passionate about things, and I want to have everything together, and perfect! It was about being optimistic, and realistic. What do you like about working together? F] Myself and David both have the vision of helping people, and we are both really creative. We have the same goals. We believe we can make a very big impact within healthcare by supporting people who use wheelchairs. D] You feel like this is part of your life, you want to help people and you are spending your whole day thinking about it! Even in your dreams, you are thinking about your project! What are your goals for the end of this year? D] We have presented the product to many people now, and we have done some user testing. Everyone has been very satisfied with our product – they’re amazed even! They want more features! For example, one person wants something to remind him of people because he forgets names! Someone wants something to remind them about taking medication, and to help with speech. For us, it’s possible to add all of these things, but it’s very much got to be step-by-step. For now, we are just focusing on the vision, the camera and the way of communication. How has the overall reception been in testing? F] We had someone named Steve say that our product is, ‘Super damn cool!’, and that it could change his life! He was really happy. D] One of the potential users commented on how the product will make her more independent, so that she then does not have to rely on others and can do many things by herself. For us, that is great! Have you both always wanted to be entrepreneurs? F] I’ve always wanted to have my own company! I have realized that the mission for me, has always been to create value for others. D] I have always been engaged with events and even some companies! Especially in Boston! This is a wicked awesome place for innovation. Raising your business is like raising your child. I feel like this is my home. Boston is great for healthcare innovation. What would be your key tips on how to build a business? F] Focus on the value you’ve created, and not the money you’re going to make. D] My tip is to have a plan. A plan comes from curiosity, and then from curiosity you can go forward and find your passion. From the passion, you can find your purpose! What kind of impact would you like to have on people’s lives with your product? F] The end goal, with our product that can be used by people in wheelchairs is to give them a whole new lifestyle. Everything will be easy, automatic, playful and cool. Above all else it will be smart. We want to enable people in wheelchairs to have as much ability as possible. D] We want this product to care about you, as a kind of friend, and partner. So this will help people to be more connected, and to have another degree of freedom.